An epic rendered; in red sandstone, this magnificent complex not only records the architectural excellence of Akbar’s times and his victories in battle, but is also an everlasting tribute to the legendary Muslim saint, Sheikh Salim Chishti. To perpetuate the memory of the compassionate saint, Akbar constructed a charming mosque, pristine in execution and appearance, in the midst of Sikri complex. 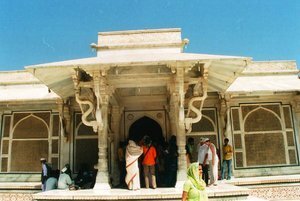 Thus, the white marble mausoleum of Sheikh Salim Chishti with its unusual carvings, decorated with tiny mother-of-pearl discs held together by minute shimmering gold pins and the soft silence within, endow it with an ethereal quality. Every year, childless women of all faiths come to pray at the Sheikh’s tomb to evoke his blessings for progeny. Hundreds of skeins of coloured thread are tied on the trellised stonework inside for wish fulfillment. His Urs (death anniversary) is celebrated during winter with great devotion by his followers. U. P. Tourism’s Gulistan Tourist Complex provides good accommodation facilities. Other civic amenities are available at neighbouring town Agra. Fatehpur Sikri, 37 km. from Agra is connected by regular bus services of UPSRTC to Agra and neighbouring centers. Regular conducted tours are also operated bus UPSTDC, UPSRTC and other tour operators from Agra. This entry was posted in Dargah of Salim, Historical places, Uttar Pradesh and tagged Dargah, Historical Place. Bookmark the permalink.